To celebrate, recognize and empower the more than 65 million family caregivers in this country, UnitedHealthcare is sponsoring this month’s webinar to be hosted on November 16. Whether you’re a caregiver yourself or you simply wish to support one, the webinar will go over the most common challenges that caregivers experience, will offer financial, legal and advanced planning tips—and the first 20 webinar attendees that call UnitedHealthcare will receive a free 15 minute consultation. Register today. Free, private, Community web sites for organizing friends, family, and colleagues – a family’s 'circles of community' – during times of need. Coordinate activities and manage volunteers with our intuitive group calendar. Easily communicate and share updates using announcements, message boards, and photos. Safely store vital information. Create a Community. As leaves and temperatures begin to fall, November is a great time for reflection. It is the perfect month to be thankful for and to celebrate our friends, families and those who care for us. November is also National Family Caregivers Month, and while it is the caregivers who are present every step of the way with their loved ones experiencing chronic illness or disability, most go unnoticed in the healthcare system. We at Lotsa Helping Hands, as well as all of you in the Lotsa Community, are in the unique position to make an impact in changing the way our healthcare system responds to family caregivers. We fully support the National Family Caregivers Association as they lead the celebration this year with their theme of Identifying Family Caregivers! 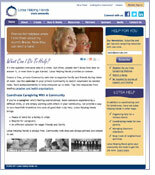 At Lotsa Helping Hands, we have redesigned our web site as a way to honor the more than 65 million caregivers among us. We hope that the changes and new additions to our site will help many family caregivers with the role that they play in their loved ones’ lives. One of our favorite new features is our Resources page. Whether you’re looking for tips on using your Community web site or need additional information about leading caregiver and health organizations, our new Resources page may help you along the way. As you explore our new site this month, we invite you to share your story. Are you a caregiver for a loved one? Or do you wish to recognize a caregiver who has inspired you? Head over to our Story Project page and tell us your story. Read on for our monthly column, tips and features. Many of us at Lotsa Helping Hands are caregivers ourselves, making this month especially meaningful and our work that much more gratifying. With the launch of our web site, we have several new and exciting tips to share this month – remember, you can always visit our How it Works Page for ideas on how to get the most out of your caregiving or volunteer coordination Community. Your Community Home Page Photo: Any of the photos from your photo gallery can be used as your home page photo. Coordinators can simply go to the Community Administration tab and click on ‘Site options’ to designate a photo for your home page. Learn from our Partners: If you are part of a Community that is helping someone with a particular illness or disability, click over to our Partners page for resources from some of our nonprofit organization partners. Check out our Resources Page: Here you can read more tips, let us know your favorite caregiving resources and watch a brief video on understanding the Lotsa Helping Hands service. This month Lotsa Helping Hands is providing a webinar for caregivers and those wishing to support them. The November 16 webinar will teach more about the solutions available to caregivers and the benefits of creating an online Community web site at Lotsa Helping Hands. Register today!